Leaning against the wall isn’t generally regarded as the most productive stance. But in the case of panel saws, it can be. A vertical panel saw has two big advantages over a sliding table saw or beam saw. It takes up a lot less floor space and it can be much easier to load. As with any machine, there are advantages and disadvantages to going vertical. For a start, it’s difficult to work small parts on most lower-end vertical panel saws because in vertical cuts the blade moves (up and down) instead of the work. That means the entire saw carriage obscures your vision and makes it extremely difficult to hold onto a workpiece by hand. The only solution is to use jigs, clamps or a vacuum hold-down, which can be time-consuming. One can also build a jig on a plywood panel to take advantage of the saw’s horizontal cutting mode (where the carriage is locked and the wood moves). In that case, one would slide the entire setup through the saw, provided it’s not too thick. But vertical panel saws are designed to rip sheet goods, not mill small parts or straight-line lumber. And when it comes to that function, they are hard to beat. Woodshop News informally asked a few small-shop owners, who run both horizontal and vertical saws, which machine they prefer. Most said that when it comes to reducing sheet goods, the VPS is by far their favorite. Conversely, shops that run very high volumes of sheet goods tend to prefer horizontal saws and a common theme was their system for material handling. The more automated the shop (in terms of forklifts, carts and conveyors), the more likely they will use a sliding beam saw or even a CNC router, especially if they have optimizing software. Loading a vertical saw can be a lot easier than working with a sliding table saw, especially in a small shop that doesn’t own a forklift. It’s a one-man operation and it can be made even easier by using a tilting cart such as the Panel Handler from Shopcartusa.com. That device flips from vertical to horizontal and can be raised or lowered with a foot pedal. While the actual footprint of a VPS is small, it generally takes up at least 20’ feet of wall space. That’s because one needs the full length of a sheet before and after the blade to load and unload it, plus a couple of feet on each end to work around the carriage guides (they lie a foot or so to either side of the blade). That generally means the shop has to realign some aspects of production such as rerouting traditional traffic paths, moving machines or accommodating storage that once used the wall space. But adding a VPS along one wall of the shop also frees up a lot of time on the traditional table saw, so workflow and overall production get a boost. When planning the space, keep in mind that you’ll also need room at each end for a cart to hold full sheets (infeed) and panels (outfeed). When it comes to employees, there are two big positives. A VPS has a very short learning curve and, because the blade is encased and remote, the saws are remarkably safe to operate. Once an employee learns about setup and maintenance, these units have very few quirks. Sawdust buildup interfering with accuracy usually isn’t a problem, unless the panels slide on a track instead of rollers (some low-end kits go that route). But several models of VPS do have minor accuracy issues: constant hard use and/or moving the saw can throw the cut off a little, so it’s important to check it about once a month. That’s especially true if the saw is delivering finished cuts. Some shops use their VPS to cut panels slightly oversized and then fine-tune them on a CNC router or use the sliding table on a horizontal saw because it has a scoring blade. If a shop is going to use the VPS to square up raised panels or do other final work that requires finesse, then frequent checks for accuracy are a must. The size of the saw has more to do with the back support frame than the actual motor. Most saws use an over-the-counter circular saw and the make and model is either designated by the frame manufacturer or installed at the factory. These run the gamut from 7-1/4″ budget models to state-of-the-art worm-drives, but in general they’re rugged, powerful and in the 8″ to 10″ range. The blade diameter is important, as it determines the thickness of material that the saw can handle. If a shop is building, say, countertops or signage, then that can come into play. The diameter of the blade generally determines the distance from the bottom of the saw carriage to the support frame, which of course is a hair more than the maximum material thickness that the VPS can handle. While most saws are designed to be able to rip or crosscut a 4×8 sheet of plywood, some can’t handle a 5×5 sheet of multiply such as Baltic birch. The blade, at full exposure, simply doesn’t have enough travel and clearance. Other saws offer options that allow mitered cuts up to 45 degrees and this can be a real boon when it comes to building Lazy Susan corner cabinets and other projects that require angled cuts. Sometimes, one adjusts one end of the bottom track and then slides the work in at an angle. Other machines (especially kit-based models) allow the saw carriage to tilt. Sizing the back support frame is challenging. 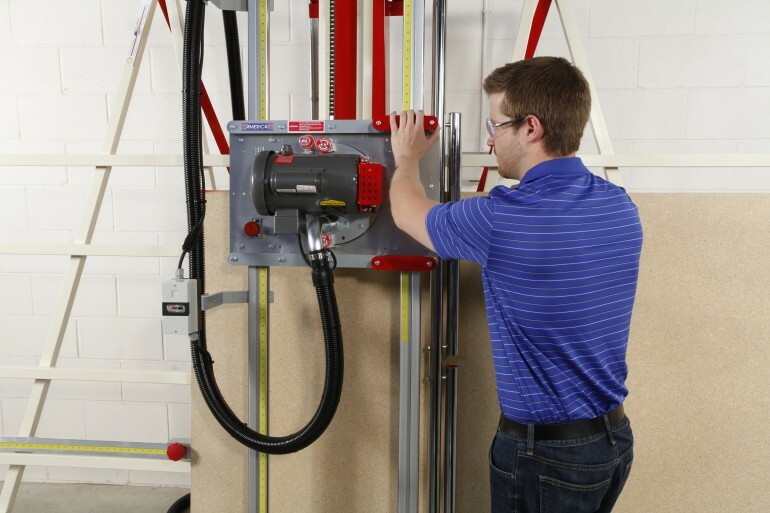 It’s tempting to go with the smallest viable option, but some of the smaller, space-saving models are designed to support less than 4 feet of the panel, so the work can tip or be awkward to load and unload for a single operator. A lot of framing carpenters are bringing small saws from companies such as Panel Pro (www.panelpro.com) or Saw Systems (www.sawsystems.net) to the job site to cut OSB panels for sheathing walls and roofs, make extruded insulation panels to size and render accurate subfloor panels. It beats the heck out of running a circular saw on a couple of sawhorses. The type of material you’ll be cutting can have an effect on the size of the motor you choose. If the shop is going to run nothing but thick MDF to create countertops, that will be a lot harder on the saw over its lifespan than sizing 1/2″ plywood. One way to ameliorate results is to go with an appropriate blade that assumes some of the workload, such as the American-made Vertical Panel Saw Blade line from Carbide Processors in Tacoma, Wash. (www.carbideprocessors.com). Its inverted V-grind is specifically designed to cut plastic-laminate and melamine-faced substrates and do so without a scoring blade. When it comes to accessories, automatic stop systems such as those manufactured by TigerStop (www.tigerstop.com) and RazorGage (www.razorgage.com) can dramatically increase both the accuracy and the speed of operations on a VPS. They might take a little ingenuity and experimentation to make them fit both the saw and the task, but once in place they bring repeatability and huge timesaving to its operation. For example, cutting a couple of dozen cabinet backs can take a while on a table saw, but having several adjustable stops set up on the VPS means that a sheet can be ripped to height and then stacked and crosscut into panels. Striebig only makes vertical panel saws, offering the 5.25-hp Compact model to the fully-equipped 7.5-hp Control model through Colonial Saw (www.csaw.com). They feature a ridged center shelf, an important aid to cutting small workpieces, a roller system that allows one person to flip a panel, completely automated controls, dust collection and much more. Holz-Her (www.weinig.com) is another high-end manufacturer of VPS, offering three standard models. Model 1254 is available in two frame versions with a cutting length of approximately 14’ and cutting height of about 6’ or 7’. A maximum cutting length of about 27’ can be achieved with model 1255, while the model 1260 automatically manages large cutting quantities in the minimum amount of time. Putsch Menicini (www.putschusa.com) has been building saws for more than 50 years at its plant in Poggibonsi, Italy. Its machines feature steel frames with 5-, 6- or 7.5-hp motors, an automatic or manual shifting grid, support foot and lift roller system. They include models 133 and 320 (for panels up to 6’3” x 10’6”), models 145 and 420 (7’s” x 13”9”), and models 950 and 980 (7’2” x 17’5”). Safety Speed Mfg. (www.safetyspeed.com) has a wide selection, stating with models C4 and C5 with 5’ frames, suitable for the jobsite and small shops. The H Series is available with 50”, 64” and 74” widths for panel materials up to 1-3/4” thick. Models 6400 and 6800 feature worm-gear saw motors. Production units include the 3-hp models 7000 and 7400, and the 7-hp ES5210. SawTrax has six lines, including two hobbyist models, model 1000 for small shops, model 2000 for production shops, model 3000 for custom door manufacturers and one specifically designed for sign makers. The company also offers numerous accessories at www.sawtrax.com. Grizzly (www.grizzly.com) offers the 3.25-hp model made by Milwaukee Tools, capable of cutting 4’ x 8’ sheets, for $1,495. U.K.-based Sagetech (www.sagetech.co.uk) has the Zapkut model for small shop and job-site use and the KoolKut line for production use on 4’x 8’ sheets. Powermatic (www.powermatic.com) carries the 3-hp model 511, featuring a worm-drive motor and casters for mobility. It can handle panels up to 5’ tall and has a built-in dust collection port. Elcon Sawing Technology, based in Holland, has been building saws since 1948 (www.elconsawingtechnology.com) and distributes in the U.S. through North Carolina-based Adwood Corp. (www.adwood.com). Its product offerings cover the gamut from small shop to large. Finally, Hendrick Mfg. (www.hendrickmfg.com) offers the ACM Duo Vertical Panel Saw, which leans toward the aluminum composite industry. For complete contact information about manufactures and sellers of vertical panel saws, please consult the Black Book resource guide that accompanies this issue or the online version at www.woodshopnews.com.